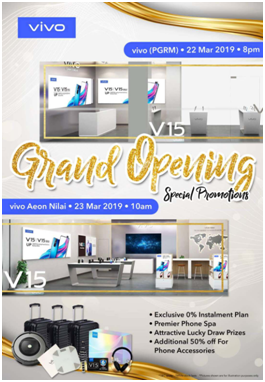 Kuala Lumpur, 21st March 2019 – Vivo will be offering a special promotion for the Grand Opening of their vivo concept store at Menara PGRM on 22 Mar, 8pm & Aeon Nilai on 23 Mar, 10am. You may visit any of the vivo concept store to purchase a brand new V15 or V15Pro to grab exciting free gifts. 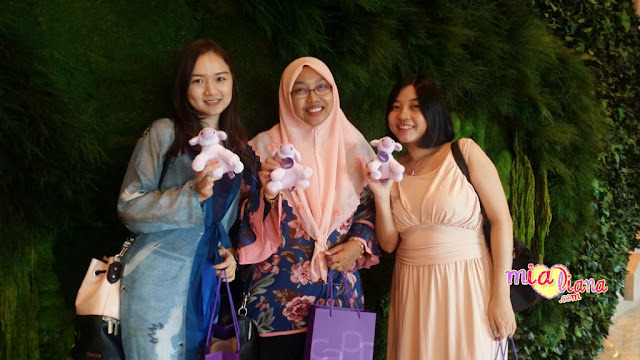 In order to thank you for the support, you may enjoy discount up to 50% for all accessories at the vivo concept store located at Menara PGRM on 22 March and Aeon Nilai on 23 March. You may also enjoy 0% interest for instalment plan when you purchase with selected banks. Customers are also able to enjoy a complimentary phone spa when you walk-in. The staff will assist to clean, disinfect and freshen up your smartphone. With the purchase any vivo smartphone at these vivo concept stores, you will have a chance to win a unit of robotic vacuum cleaner and other attractive prizes in the lucky draw. For more information, please visit Vivo Malaysia on Facebook, Instagram, Twitter and Youtube.